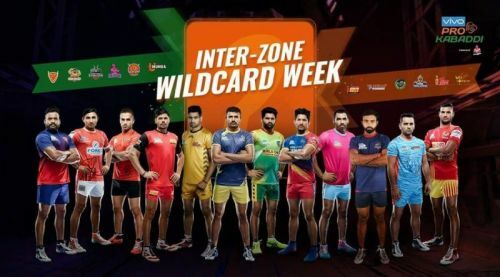 Inter-Zone Wildcard matches are matches where a team from Zone A plays another from Zone B in Pro Kabaddi League 2018, and the teams that will face each other have been decided by a draw of lots. Unlike the Inter-Zone Challenge Week where we have a week designated solely for Inter-Zone matches, there are 6 Wildcard matches, that are dispersed in between the regular matches and would take place each day from the 21st of December to the 27th, with the exception of the 24th which is a rest day for the teams. This is an exercise in which luck plays a crucial part, and could play spoilsport to the playoff chances for a quite a few teams, especially from Zone B, from where two teams for the playoffs are yet to qualify. Patna Pirates, Telugu Titans, Bengal Warriors, and UP Yoddha are in contention for the two spots left in the playoff stages. 23/12 - 8 pm IST - Bengal Warriors vs Dabang Delhi K.C. All these matches would be played at the Netaji Subhash Chandra Bose Indoor Stadium in Kolkata, and can be watched on the Star Sports network or can be digitally streamed on Hotstar.